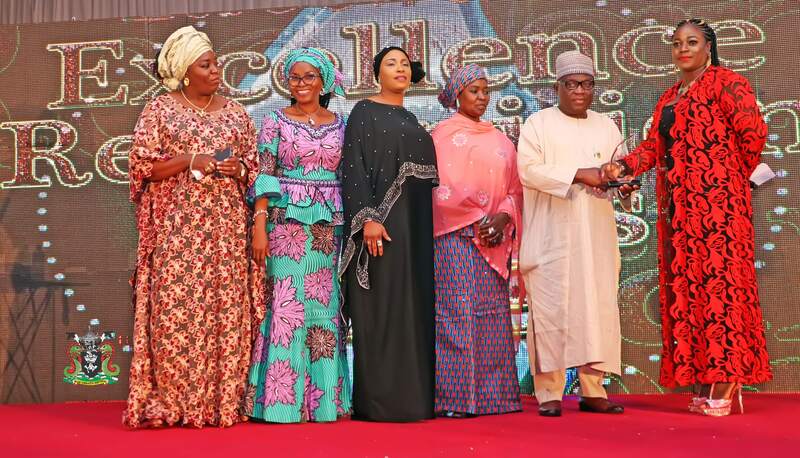 The Nigerian Ports Authority (NPA) has been adjudged the Most Productive Government Agency of the year by the Global Excellence Communications, Nigeria’s Hottest Celebrity Journal in Lagos. The representative of the MD, NPA, the General Manager, Corporate and Strategic Communications, Engr. Adams A. Jatto (2nd from right) received the Award from the Chief Executive Officer (CEO), IRACHY PR and Founder, African Women Foundation for Nation Building. Dr. Bukky Bello Jaiyesimi (right), and supported by the GM, SERVICOM, NPA, Hajia Harira Mohammed (4th from left), the Asst. Gen. Mgr, Environment, Khadijat Sheidu Shabi (3rd from left), the Principal Mgr, C&SC, Catherine Ude (2nd from left) and the Snr. Mgr, C&SC, NPA, Victoria Tarfa (left) during the event.